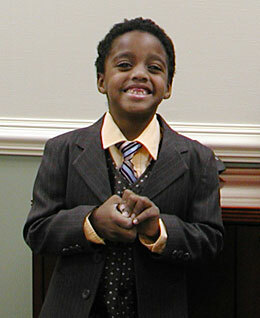 Caleb, 6 years old, is all smiles during a Civil Rights Summit held at the US Attorney's Office in Mobile, Alabama. Caleb and his mother were honored guests at the Summit in recognition of their participation in U.S. v. Wales West LLP, a case brought by the United States to remedy HIV discrimination by the owner of an RV resort and campground in Alabama. United States v. Drew B. Morvant, D.D.S.